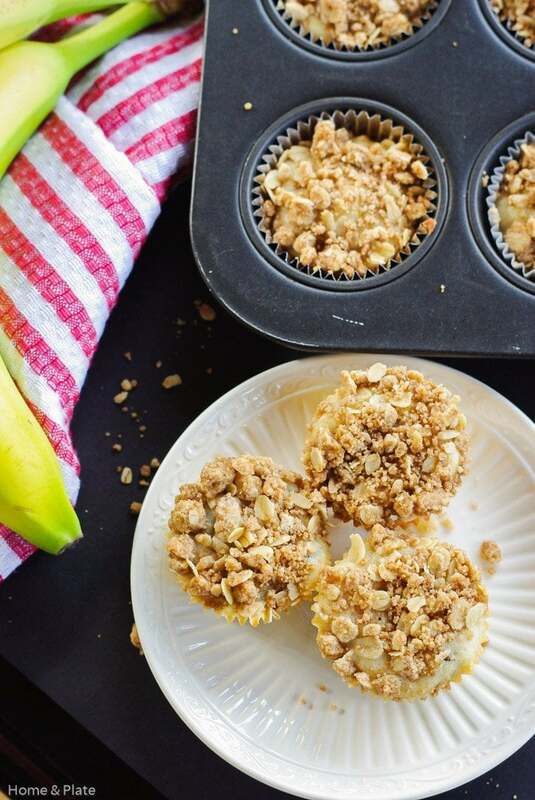 These moist banana muffins with a streusel topping use up extra ripe bananas you don’t want to toss and result in the softest, moist muffins. The streusel crumble oat topping is crunchy and sweet. It’s the perfect addition to a plain banana muffin. I’ve got one kid that loves chocolate chips and the other, not so much. So I usually make half the batch with chocolate chips and the other half without. These moist banana muffins would be just as delicious with chopped nuts instead of chocolate. They make a great after school snack or even a quick breakfast for those mornings when you’re rushing to get out the door. Bananas are so healthy for you, loaded with potassium and vitamin C, and a great choice if you’re looking for a nutrient dense power food. These muffins pack all that goodness in each morsel. I promise they will give you just the right amount of energy to keep you going. So next time you are thinking about tossing those too-ripe bananas, think again. 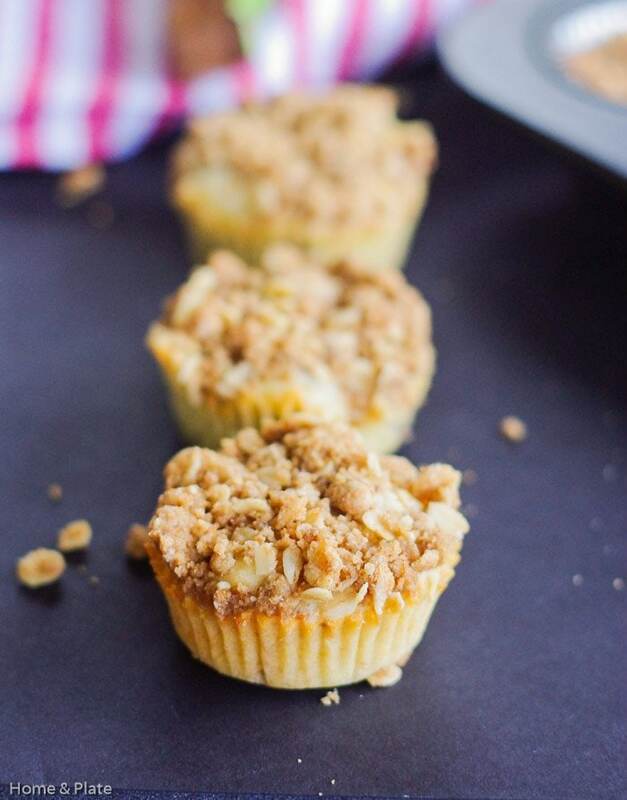 These moist banana muffins with a streusel topping use up extra ripe bananas you don't want to toss and result in the softest, moist muffins. Preheat the oven to 350°F. Line a muffin tin with 12 muffin liners. Mix together the egg, bananas, milk, melted butter and sugar using a mixer until blended. Add in the flour and baking powder until blended, being careful not to over mix. If using chocolate chips stir them in by hand. Fill the muffin tin with batter, filling each about 3/4 full. Mix together all the ingredients for the streusel topping including the 1/4 cup flour, oats and brown sugar and the 2 tablespoons of melted butter. Sprinkle 1 tablespoon of the topping over each muffin and bake for 30 minutes until the muffins are golden on top and a toothpick inserted into the center comes out clean and not gooey. yep, over ripe bananas are made into bread or a smoothie – when eating a banana as is, I actually prefer the under ripe banana – totally different flavor! these muffins look perfect! me too. I prefer my banana with no spots at all to eat out of the skin but the overripe ones are perfect for a sweet muffin. Thanks Kristina. 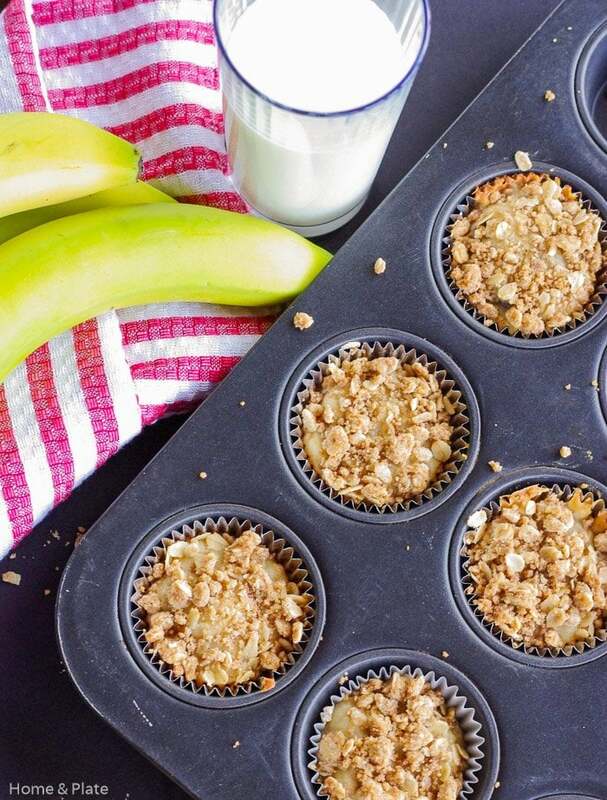 Banana plus streusel all in a muffin?? Total win! My daughter loves banana everything and she’s headed to a dance competition this weekend. I see these as a nice in between dance snack. Only problem is, if I make it for her I have to make two batches to feed her friends too! You will definitely need to make two batches. Good luck at the dance competition. The streusel on top adds just the right about of crunch. So yummy. Thanks Kacey. I so dig bananas and I still but way more than I can eat before they go bad. Maybe I am doing it accidentally on purpose so I can have some over ripe ones to make recipes like this one! My kids would love these! 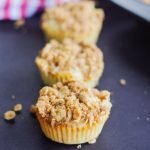 I’m convinced that all muffins must have streusel topping as well. And, I love the idea of using our ripe bananas for more than just our go-to banana bread. Thanks for the recipe! Yes….kiddo favorite and good for you too.